Lasers passing through the crystal. Image credit: Dr. Matthew Sellars, Laser Physics Centre, ANU. Dr Matthew Sellars said the team are working to develop memory for quantum computing, a new way of storing and processing information that would be drastically faster and more powerful than existing computers. “Stopping light is not just a neat trick, it is the basis of a quantum memory — a device capable of storing and recalling the quantum states of light. This is one of many quantum computing components under development in our lab,” Dr Sellars said. “We use a small silicate crystal doped with a rare-earth element, praseodymium. It is on the praseodymium ions that we store the light pulse. Using this method, the researchers have slowed the speed of light down from 300,000 kilometres per second to a few hundred metres per second. “To store the light in there, we turn the second laser beam off. 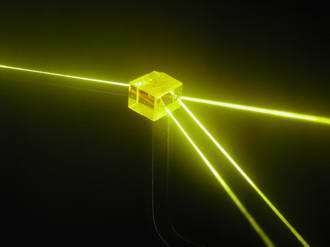 The signal from the first laser beam is trapped inside the crystal. To get the signal out again, we turn the coupling beam on again. We can now store light for seconds, and potentially quite a bit longer,” Dr Sellars said. The team are now trying to refine the process so they can store a single photon, which will require a larger crystal, ten times the size of the one currently in use. Co-researcher Dr Jevon Longdell says setting a new world record for stopping light has been a major victory.